No one says that they want a minivan. It has a stigma, a stereotype. Minivans scream soccer balls and football helmets, grocery bags and yoga mats, gluten-free cookies and organic milk. But despite their boring reputation, moms drive minivans for the practical applications that your fancy sports cars or luxury models don’t have. Moms need room. They need a one-bedroom efficiency on wheels to handle all of the sports equipment, goody bags and pompoms that need to be transported on any given day. In the past, minivans have not called for many bells and whistles. Moms have been satisfied with an automatic door here and a child lock there. Well, times are changing. There is a certain desire to be cool in the carpool line. And some minivan manufacturers are answering the call with their 2015 models. The 2015 Kia Sedona has come to the minivan playground ready to rock. The second row slides, the third row hides, and it can seat up to 8 play-date participants. Add in the multiple USB ports for Mario Kart and a fish-eyed mirror to see who really hit whom, and you’ve got yourself mom’s dream. The Dodge Caravan is usually on top of its minivan game … and the 2015 model isn’t any different. 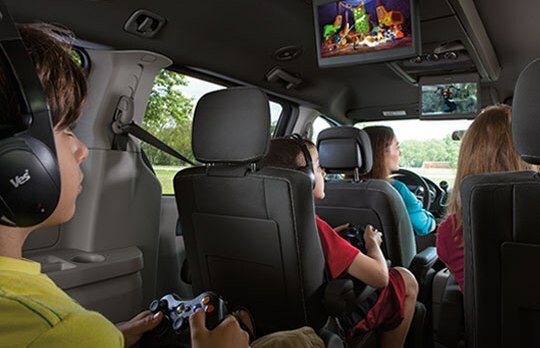 Along with three-row seating, power-sliding doors and a power lift gate, it also offers packages that include satellite radio with Bluetooth audio, voice control, a TV screen above both the second and third rows and a 3G access that transforms the Grand Caravan into a WiFi hotspot. Why buy a house? I would go into the litany of features that are popular in minivans these days, but there is only one that matters to me in the Toyota Sienna. It’s the Driver Easy Speak feature allowing moms to speak into a microphone and broadcast that they are indeed turning around and going home. Ditto for the Honda Odyssey. It has the same great features as some of the competition. But the HondaVAC in-vehicle vacuum system gets high-praise from moms across the nation. It’s complete with filter bag, debris canister and 10-foot hose. Go ahead, it’s okay to cry. No longer is it enough for the minivan to be functional but lack flare. With the latest technology and the coveted space, minivans just might make the cool list after all.